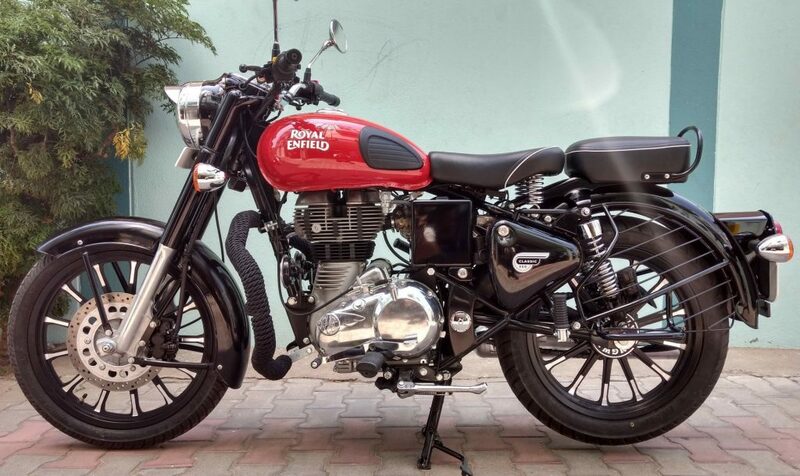 Royal Enfield Classic 350 Redditch ABS Launched In India; Priced At ₹ 1.53 Lakh. Royal Enfield has been updating its line-up with Anti-Lock Brakes (ABS) since August this year, ahead of the April 2019 deadline. Joining its line-up of ABS-equipped models is the Classic 350 Redditch Edition that now gets the safety feature. The Royal Enfield Classic 350 Redditch Edition ABS is priced at ₹ 1.53 lakh (ex-showroom, Delhi), which makes it about ₹ 6000 more expensive than the non-ABS version. The Royal Enfield Thunderbird 350X ABS was introduced last month priced at ₹ 1.63 lakh and followed up with the launch of the Thunderbird 500X ABS priced at ₹ 2.13 lakh (all prices, ex-showroom Delhi). The 350 Redditch is powered by the same 346cc, single-cylinder, air-cooled engine found in the rest of the Classic 350 range. Output figures, too, remain unchanged at 19.8hp at 5,250rpm and 28Nm of torque at 4,000rpm. The bike comes in three colors inspired by the models built during the 1950s at the Redditch factory in the UK. Royal Enfield has now equipped most of its portfolio with ABS with only the standard-color variants of the 350 Classic and the Bullet series yet to receive the feature. The addition of ABS on the Classic 350 (Signals, Redditch and Gunmetal Grey variants) helps it further rival the Jawa and the Forty-Two which were recently equipped with a rear disc brake and dual-channel ABS. The ABS-equipped Jawa has been priced at Rs 1.73 lakh, while the similarly-equipped Jawa Forty -Two has been pegged at Rs 1.64 lakh (all prices ex-showroom), which is a considerable premium over the ABS-equipped Classic 350s. The Redditch edition bikes are offered in three colors – red, blue and green – for the fuel tank,with the rest of the bike finished in black and chrome. Apart from the new colors, the bikes also feature the Royal Enfield Redditch monogram which was first seen on the 1939 125 cc Royal Baby prototype. Next story How To Claim Unclaimed Insurance Benefit?